A half eaten Zog's Dogs. How do hot dogs show love? With two hot dogs on one bun, of course. Zog's Dogs in the City is giving away free hot dogs in protest of Prop. 8, the California ballot measure that outlawed gay marriage. Somehow in honor of the controversial measure, Zog's Dogs is putting two hot dogs on one bun for the special promotion. "Two hot dogs on one bun. 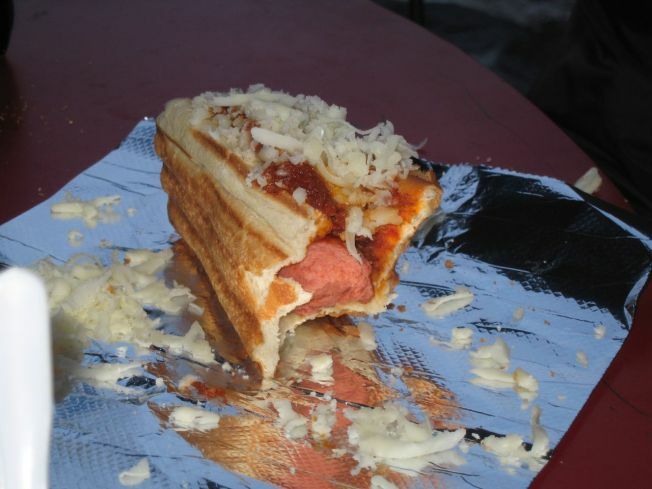 The more love the better, the more hot dogs the better," Zog's Dogs wrote on its website. Political foodies need to send a self addressed stamped envelope to Finney's Friday Free Stuff, 900 Front St., San Francisco, CA 94111 to get a coupon to eat for free.